The island of Bohol is accessible to by Philippine Airlines and Cebu Pacific Airlines. Daily direct flight frequency from Manila. Travel time is approximately one hour. There are several inter-island vessels and fast ferry boats that plies the Cebu-Tagbilaran route daily. 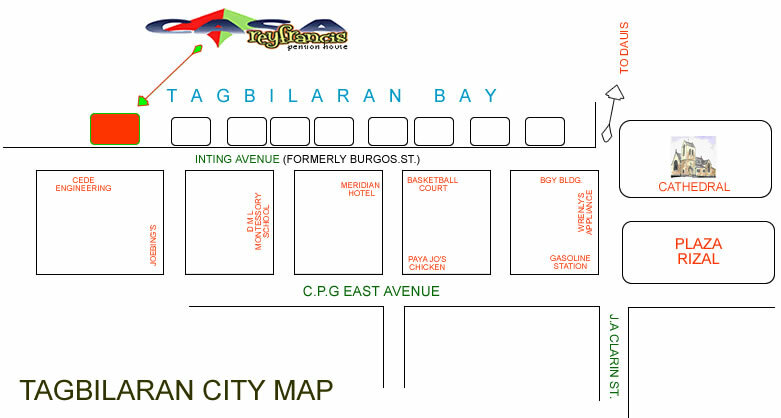 Several trips serve the Cebu-Tubigon port, a town 54 kilometer away from the city. Twice weekly trip from Siquijor. Daily fast ferry serve from Dumaguete and Cagayan De Oro City. Boat from Manila visit the port thrice weekly. The gateway of passengers from Mindanao is the Jagna port. A vessel serves the Cagayan-Tagbilaran port twice weekly. Casa Rey Francis PENSION House is located in the eastern commercial zone in the city of Tagbilaran., the capital in the island of Bohol. Bohol is known of its famous Chocolate Hills naturally carved by nature and the white sandy beaches in the island of Dauis and Panglao coupled with the eco-cultural tourist destinations to the different parts of the province. Casa Rey Francis Pension House is just 10 minutes ride from the city airport and 8 minutes ride from the wharf. It also offers a tour package to its guests when requested.